Domain knowledge: MMDU faculty guide students about the software industry and its history, the software profession, and topical software industry issues with the help of both theoretical and practical sessions. Domain Technical Skills: Technical skills are what enable professionals to perform specific tasks relating to the domain, which in this case is software development. Soft Skills: Bysoft skills we mean Communication Skills, especially in English, because. English is the language of software development worldwide. To be job-ready as a software developer the graduate must be fluent in writing, reading, listening and speaking in English. The SD Program is taught in English, and during this course, students are groomed with effective communication skills so that they can be clear, accurate and confident in all aspects of communication in English. Behavioral Skills: Many Companies, while selecting their workforce, not only approach employees with right technical skills but also demand that their employees should be able to use their skills effectively while working in tandem with other team members. The SD course is the only BTech program that we are aware of that actually teaches behavior skills, and provides feedback to students on their behavior skills to help them gain reflective ability in dealing with various situations they may come up against while on-the-job. Work experience on live projects: MMDU helps graduates to be market-ready and successfully face challenges that may come up by having them work on real projects in simulated work environments creating the same deliverables that professionals create using professional tools and processes while pursuing the SD course. Instead of following theoretical patterns, students learn by working on large, realistic projects from corporates, and not just small projects or case studies. What Makes the Course BTech Computer Science Software Development Stand Out? A student gets an American education at Indian prices. Isn’t it interesting for those who want to study abroad for quality education? Students are given with the chance to work on real-life situations that they will face while on-the-job. Students get personalized guidance from professionally-trained mentors. The course is designed by former Carnegie Mellon University professors having years of industry experience. Students along with their degree in B.Tech CSE with specialization in Software Development earns rich industrial experience equivalent to two years of on-the-job experience. Great Placement opportunities! Scores of companies visit MMDU campus to hire students. Traditional CSE graduates might be having a broad technical education, but this course helps you get an edge over the competition by learning things that every company expects from an employee. What are you waiting for? Seize the opportunity to become job-ready by joining CarterRadley’s Software Development BTech CSE Program, now exclusively offered at MMDU. Is this a difficult program to succeed in? This is not a difficult program to succeed in. We say that there is only way to fail this program, and that is to not try. If you try, you will succeed. At the same time, it is not an easy program because there are many deliverables for each student to produces each week. Students who want to become job-ready at graduation must realize that they will only become job-ready if they do all of the assignments given to them. What does it take to get admission? Admission for B.Tech Computer Science with specialization in Software Development requires students to score minimum 60% marks in 10+2 from a recognised University/ Board as well as score good ranks in JEE main entrance exam. 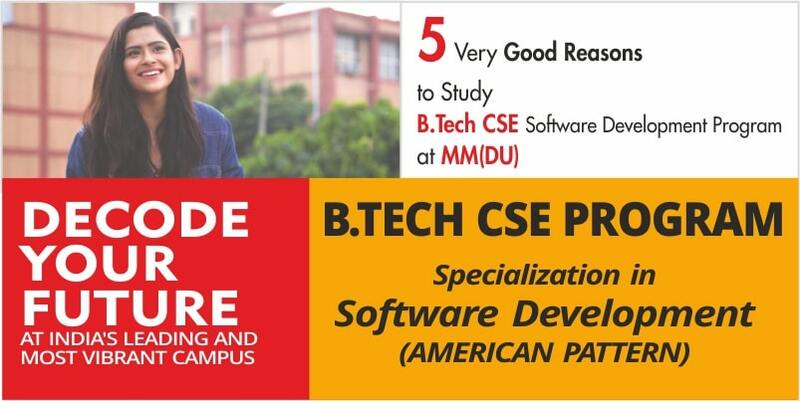 Step towards bright future now by joining BTech CSE Program with Specialization in Software Development and start earning whooping salary as soon as you complete the course. Hurry! Only a few days left to grab the chance, or else you might be out of luck.